The invisible deck is a trick deck of cards with nearly endless possibilities. It is also known as an imaginary deck, and to magicians, it is referred to as a utility deck. It’s a great deck of cards to have in your repertoire as a magician because you can perform many tricks. You can convince strangers that you are a powerful magician. All it takes is a matter of seconds to prove your powers. The invisible deck is not a sleight of hand trick. Its effects are not achieved because of the way you deal the cards or hold the cards. Nothing is up to your sleeve. The secret lies entirely in the deck itself and the way you arrange it. The classic way of performing the trick is that a magician asks someone from the audience to imagine a deck of cards. The audience member mimes shuffling this imaginary deck of cards, and then removes a card from the deck. Then pretends to look at the imaginary card, memorizes, then to place it back faces down with the rest of the cards. At this point, the magician brings out the real deck of cards. The magician asks the volunteer what card he or she picked. Then the magician fans out the deck of cards and explains that they are all face-up except for the card that the volunteer picked from the imaginary. For example, the volunteer reveals that he/she picked the 5 of diamonds, the magician would fan out the card until he hit upon one face-down card. He removes the card and flips it over, revealing the 5 of diamonds. Variations of this trick involve the illusion of mind reading. Rather than miming picking a card from a deck, audience members are asked to simply picture a card in their heads. When the magician produces the exact card that the audience member picked, the magician seems to read their minds. Once you know how this trick works, you can apply its principles to a broader range of tricks and truly appear to be able to read minds at will. You can always lengthen or shorten the trick depending on the effect that you want to achieve. If you were doing a bit of street magic, you might want to do the trick quickly. However, if you were performing on stage, you might want to draw it out more. You might ask the volunteers to keep narrowing down their choices to add to the suspense. First, ask them to pick either even or odd numbers. From there, make them choose spades or diamonds. The more choices you make the volunteer make, the more the anticipation builds. For parties or street magic the trick works best in a quick flash. You just walk up to a person and ask them to name a card. They say the 2 of hearts, and you pull out your box of cards. You remove the deck from the package and let the person observe that all the cards are face up. All the cards are face up except one card. You pull out the face-down card, flip it over to reveal the 2 of hearts and then put the deck back in the package and walk away. In this scenario, doing the trick once and quickly, it helps to leave your audience bewildered. You just swooped in, dropped a magical bomb, and then in a flash; you’re gone. How on Earth did you do that? They might beg to do it again to try to figure it out, but one taste is all they get. So how does it work? How can a magician, without sleight of hand, get the exact card that someone said out loud from a pack of cards? Not to mention it hasn’t gone out from the pack yet. It sounds like it must be complicated, but again, the unique construction of the deck does all the work. 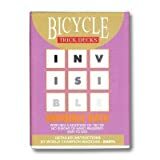 You can purchase a pack of cards for the invisible card trick, or you can make your own. Either method employs the rough and smooth technique. This is used in many magic tricks. When applied to cards it means that one side of the deck is rough, and one side is smooth. Since the texture is different, the cards can stick together or pull apart, depending on the touch of the dealer. In this trick, the cards are rough on their backside, so they stick together. This means that both sides of the deck when fanned out, are face up. On one side of the hand, even number and on the other side are the odd numbers. The aces are worth 1, the Jacks are worth 11, the queens are 12, and the kings are 13. Each pair of cards is arranged so that the pair adds up to the number 13. The kings are paired together. Red kings are odd, and black kings are even. Hearts are always paired with spades, and diamonds are always paired with clubs. Okay, so you go up to someone at a party and ask them to name a card. They name the 8 of clubs. You take your deck out of the box so that the odd numbered cards are facing up. You know that eight plus 5 equals 13 and that diamonds are paired with clubs. That means that as you fan the deck out, you are looking for the 5 of diamonds. You are looking for the 5 of diamonds because you know that it is paired with the 8 of clubs. When you find the 5 of diamonds, you push the 8 of clubs out from behind it. It will appear face down in the deck. When you flip it over, voila. It’s kind of a mic drop moment. If someone were to say the ace of spades, what would you do? Aces are worth 1, so need the card that is worth 12. That’s a queen. Spades are paired with hearts, so you need to find the queen of hearts. Once you’ve got the queen of hearts, you just need to gingerly slide the ace of spades out from behind it. There are two things to remember when you perform this trick after you have mastered the system of arranging the cards. The first thing is how you take the cards out of the box. If someone asks for an odd numbered card, you remove the cards from the box where the even numbers are facing up. If someone asks for an even card, then you remove them with the odd numbers facing up. The second thing is how hard, or light your touch needs to be on the cards. When you fan them out to find the correct card your touch needs to be light. If you are too heavy-handed, the cards will begin to separate, and the trick is a bust. When you get the right card, you have to have enough quick force with your fingers to slide the rough-sided card free. If the cards stick together, you’ve botched the trick. 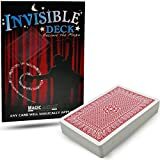 You can purchase an invisible deck from lots of online sources, but you can also make your own. The advantage of making your own is that you can turn any deck of cards into an invisible deck. All you need is a deck of cards and a can of matte finish clear spray paint. Lay the cards face down on a surface that is out in the open to spray paint on. Spray the backs of all the cards and let them dry thoroughly. Then arrange the cards according to the above system. The thin layer of spray paint makes the backside of the cards just tacky and rough enough so that they stick together. Remember, you’re not trying to glue the cards together, you want enough resistance to keep them from fanning out when you display them to the audience. With the right deck and practice, you’ll be able to perform the trick that will leave people mesmerized and dumbfounded. They’ll know that it was a trick, but they will ponder it over with the only conclusion that you are truly magical and a mind-reading expert. That’s a pretty nice return on a pack of cards and a little bit of memorization.